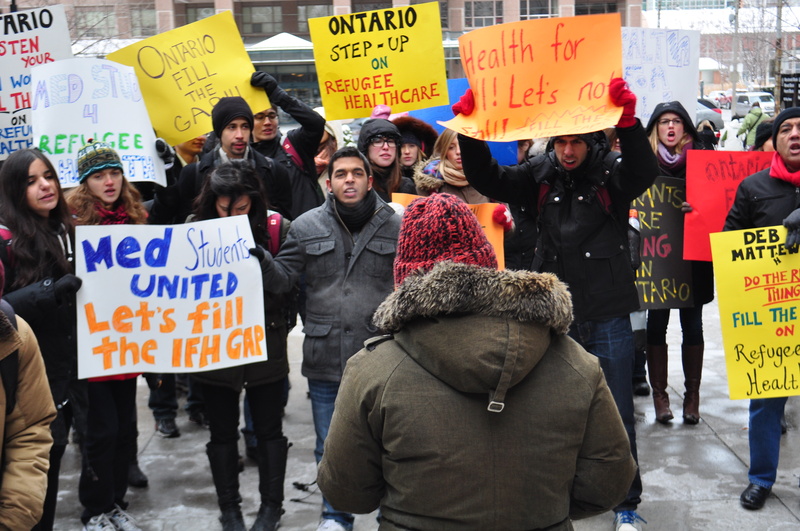 Protesters demand Deb Matthews fills the gap in health care coverage created by Federal cuts to refugees. There were hard lessons learned today about how democracy is practiced in this province. About 60-70 protesters, most young health care workers and students, spent more than an hour and a half today outside the downtown Toronto offices of the Ministry of Health. They waited in the bitter cold, hanging on for a possible meeting with Minister Deb Matthews. The size of the crowd varied as participants left and returned again in an effort to keep warm. 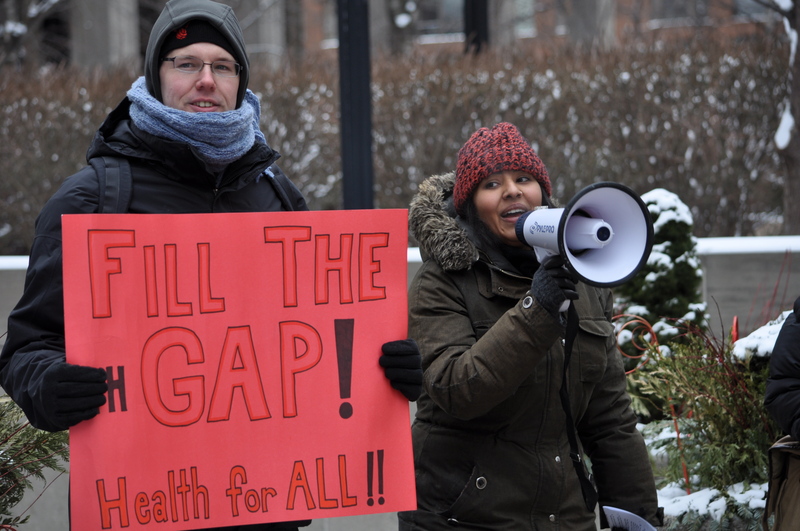 Upset about last year’s changes to the Interim Federal Health Plan that would deny many desperate refugees access to our health system, the protesters wanted Ontario to fill the gap left behind by the senior level of government. Several other provinces – including Saskatchewan, Manitoba and Quebec have already done as much. Manitoba said it would send the bills back to Ottawa. So why is Ontario waiting? Health Minister Deb Matthews had already provided the group with all the arguments they needed. She wrote to Federal Citizenship and Immigration Minister Jason Kenney back in December, suggesting that such cuts not only represent downloading to the provinces, but risked escalating the cost of care for these individuals as small problems turned into larger ones without access to reasonable health care coverage. Usually when a Minister of the Crown doesn’t want to meet with a group at her or his door, they get their staff to send a message that the Minister is not present. That usually does a good job of deflating demands for a face-to-face meeting. Instead Matthews sent down word that “maybe” she would meet with them. About 10 minutes later a delegation of four was invited to meet with Matthews’ staff, but no media would be allowed to enter the building. Outside the protesters were told Matthews herself would be unavailable. Persistence paid off – the inside delegation was eventually ushered to meet with the Minister, who showed due concern but made no commitment about the province filling the gap. She did promise to look at what the other provinces were doing. Outside organizers wanted to know why Matthews and her staff were afraid to come out and talk to the larger group. This was hardly an angry mob, but a peaceful demonstration, many of them Ontario’s future doctors and nurses. Not only that, but there was a bored-looking OPP officer for about every five demonstrators. While the delegation went inside, organizers read out loud cases where refugees had recently been denied access to necessary health care. 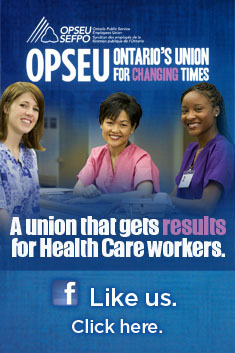 It is a blight on Canada to deny necessary access to care for those specifically among us whose health is in jeopardy. Ritika Goel speaks with the media. 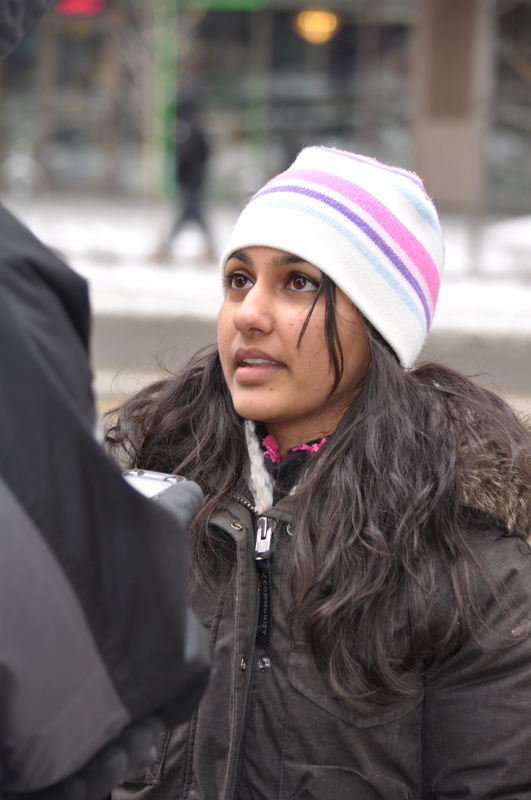 In interviews with Health4All’s Ritika Goel, the media predictably asked about costs. Goel said cost was irrelevant – this was a matter of human rights. She did say that Kenney projected that net savings for the Federal government will be about $20 million annually, a figure even the media seemed to recognize as small change on a national scale. Canada spends about $200 billion on health care annually (public and private). Evidently the Harper government believes the life of a group of refugees is not worth what works out to be about a nickel a month for the average Canadian. The fact that nobody thought it necessary to come out and talk to the group is shameful. To leave them dangling in the extreme cold was about as insensitive as… denying penniless refugees fleeing oppression access to desperately needed health care for their families. Undeterred, the protesters promise to be back. Why wouldn’t Deb Matthews come out and talk to these students?